There is an old folk tale about a scorpion that asked a frog to give him a lift across a river. The frog was naturally frightened that the scorpion would sting him, but the scorpion promised he would not, and pointed out that, were he to sting the frog while they were en route, they would both drown. The frog was reassured and took the scorpion on his back but, when they were half way across the river, the scorpion stung him. I was reminded of that story in reading Ranil Wickremesinghe’s comments at the Opening Session of the Commonwealth Parliamentary Association Regional Conference. He had performed his usual number about the deficiencies of the government and the wonderfully altruistic approach of the opposition. He had certainly chosen a strange audience for his plaint. Years ago he used to be egged on in his efforts to undermine the government by that gaggle of sanctimonious diplomats, Juergen Werth and Angela Bogdan and Dominic Chilcott and Julian Wilson and that preposterous Dutchman whose name I cannot remember. But all but one of them were replaced by less manipulative characters, and the short term memory of Camelot (Ranil as King Arthur, President Kumaratunga as Guinevere, Mangala Samaraweera as Sir Lancelot, Bradman Weerakoon playing Merlin) faded, and serving diplomats no longer thought their main duty was to wake the sleepers in their caves and restore the old regime. India and Pakistan and our neighbours however were always very different, committed to working with a democratically elected government. And India in particular, which has always taken Sri Lanka seriously, had a long term memory too, and remembered Ranil’s role in creating the current problems. Of course he may have reformed, and when he was Prime Minister they worked with him positively – but they would not have forgotten his speech in Chennai in 2003, when he claimed that democracy could be suspended for the sake of economic development. His current assertion then that ‘establishing a Constitutional dictatorship, supposedly for the purpose of furthering economic development and prosperity is also unacceptable’ would have sounded to them then like someone engaging in self-criticism. 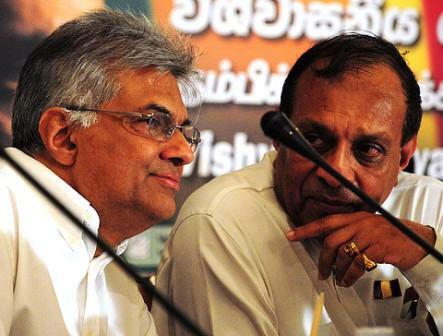 Ranil’s latest effusion is the more bizarre – and more scorpion-like – in that it occurs at a time when many in government think his continuation as Leader of the Opposition would be more convenient in that it would ensure permanent victory at elections for the government. I think this view is wrong, not because the alternative would not be more popular electorally, but because the constant undermining of government does more damage to the country as well as the government than effective internal opposition, which might also help to keep government on its toes. Indeed in that regard I have also pointed out that the assassination by the LTTE of Gamini Dissanayake was as much a tragedy for President Kumaratunga as for the UNP and the country, in that it allowed her to relapse into indolence, knowing that Ranil would find it difficult to defeat her electorally. The result, as one intelligent diplomat put it in 2001, was that we had slid backward more quickly than he had seen in any other country. He cited, as a simple example, the failure to move on Norochcholai and Upper Kotmale, matters which Ranil too ignored, until President Rajapakse ensured effective action as soon as he came into office. I hope then that Ranil’s latest barb will convince the government that he really should not be shored up in office. And I have to say that my old idea, that Karu Jayasuriya would make a good interim leader, has also been destroyed by his own imitation of his leader, in relentlessly idiotic attacks on the government as well as everyone else. His latest pronouncement is that what happened in Egypt has lessons for Sri Lanka. He ignores the fact that in Sri Lanka there have always been elections, except for the dark period between 1983 and 1989, when however he was not one of those Members of Parliament who voted to postpone elections. But what is saddest is that he also thinks it fit to score cheap debating points about President Mubarak, noting that he is ‘Eighty two years old and still sporting jet black hair’. He imagines, I suppose, that his sophisticated listeners will all think how clever he is at thus obliquely mocking the Sri Lankan President. This is vulgarity of a sort that I had not thought Karu capable of. I remember Tarzie Vittachi writing many years ago that the Sri Lankan trait, when advised that you should not kick a man when he is down, was to respond, ‘What better time to kick him?” I had thought that an exaggeration, but to find it practiced by someone I thought a pillar of decency is most disillusioning. I believe all politicians should as a matter of principle never say about someone when they are out of power what they failed to say when they were in. I know sometimes it is difficult to criticize people when they are in power, and it is also inappropriate to be nasty about leaders of countries with which one has good relations – but to take advantage of them losing office is disgusting, and I had expected better from someone I used to think of as a dignified old gentleman. Sadly, in now affirming his loyalty to his current leader, he seems to have picked up the most unpleasant of his traits. Amongst these is forgetfulness. His own record was not bad I believe during the horrors of the eighties, the attacks on Tamils, the blatant stuffing of ballot boxes when individuals such as Duncan Fernando walked the streets with goons and guns on election days. That is why I hoped he would bring a breath of fresh air to the UNP. But he certainly said nothing then, and continued to enjoy the fruits of office. He is better equipped therefore to talk about the positive features of democracy than his leader; but to put himself in the class of a freedom fighter on the lines of those who ‘risk life and limb demanding freedom for Burma and Tunisia’ would be laughable if it were not also so tragic.